With so many whey formulas available, choosing the right one is hard. Without the right knowledge, you might end up picking a whey supplement that is full of fillers, sugars and other useless stuff. 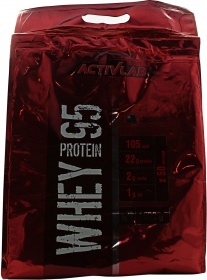 Activlab clears all the confusion and gives you the best whey formula for your active lifestyle –Whey 95! Whey 95 is custom-tailored for fitness buffs like you who need a reliable source of high quality whey protein for building and repairing muscle mass. Each delicious serving of Whey 95 gives you 22g of Whey Protein, a complete protein rich in EAAs (Essential Amino Acids) and BCAAs (Branched Chain Amino Acids). These amino acids support protein synthesis and promote a positive nitrogen balance in the body, allowing your muscles to grow and regenerate faster. With only 2g of carbs and 1g of fat per serving, Whey 95 is also a great protein shake for those who are on a diet, and those who are trying to limit their calorie intake. And of course, every creamy serving of Whey 95 is an absolute delight for your taste buds... its rich taste and texture will have you craving for the next serving! 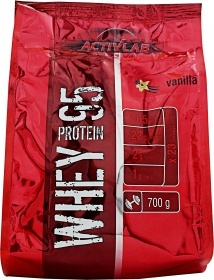 Enjoy high quality whey protein that suits your fitness-oriented lifestyle – make the right choice with Activlab Whey 95! Have a question about Whey 95? What is it, what does it do, how and when to use or something else? Ask us. Other Ingredients: Whey protein concentrate 95%, aromas, acidity regulator: citric acid, thickening substance: E466, sweetening substances: E950 and E951, dyes: E124 (strawberry flavour) - it may adversely affect the activity and concentration in children, E150c (chocolate flavour), E171 (vanilla flavour). ALLERGEN INFORMATION: Contains a source of phenylalanine.,May contain traces of gluten, milk, soya and nuts. Dissolve 30g (1 measure) in 250ml of water or milk. Take 2 a day, in particular just before going to bed and after waking up.